In the 1970s and early 80s, they were the movers and shakers in Cardiff by the Sea. “Now we’re just creakers and crawlers,” joked Meg Kleeb. 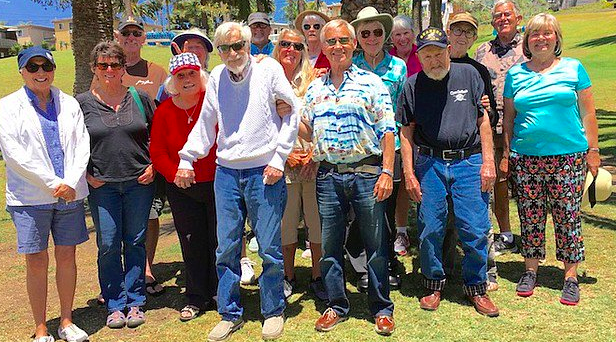 A group of 16 longtime Cardiff residents met in Glen Park on May 17 to reminisce of the days before Encinitas cityhood. Attorney Bob Macfarlane was the lawyer for the volunteer Cardiff Town Council. He remembers driving down Coast Highway 101 at 5:00 a.m. and seeing a sign company replacing a storm damaged billboard in the San Elijo Lagoon. Linda Laws got involved in the Cardiff Town Council when the chamber of commerce was pushing the idea of turning the San Elijo Lagoon, then mostly a smelly slew, into a yacht marina. Macfarlane worked on the town council’s voter referendum in 1984. It stopped the city of Escondido from pumping its raw sewage down to a proposed 10-million-gallon-per-day facility to be built next to the lagoon. It forced the city to build its plant in Escondido, and pipe only its treated water down to the Cardiff outfall. Marion Mullins was the first woman elected to the Cardiff school board. As a school parent she ran because none of the board members had kids in the schools, and school superintendent Ed Kaufahl did not welcome parent involvement. Jane Schmauss was Mullins’ campaign manager. “It was clear they didn’t want females on the board,” said Schmauss. After Mullin’s overwhelming election, “Kaufahl resigned the next day,” said Mullins. Schmauss went on to open George’s restaurant on Coast Highway. With its hanging displays of collectable surfboards, it the start of the California Surf Museum, which Schmauss co-founded later. Linda Berry McLean Lux remembered in 1977 when Cardiff started hosting We Love Cardiff Days with a parade, street dance, and a town picnic. Always held the weekend after Labor Day it inspired that next spring, the Cardiff school’s Ice Cream Social. The next year came Encinitas’ first Flower Festival, and Solana Beach’s Fiesta del Sol. Ken Harrison was president of the Cardiff Town Council from 1978 – 1982.